PACEMAKER BELFAST 24/03/2019 A cash machine has been torn from the wall of a filling station in Irvinestown, County Fermanagh. The built-in ATM machine was removed by a digger, which police suspect was stolen from a nearby building development. The thieves are understood to have loaded the cash machine onto a trailer before setting the digger alight and fleeing. The incident happened at Dromore Road around 04:05 GMT on Sunday. Scene of the ATM theft on Sunday morning. A retail body has called for an urgent meeting with police, banks and the construction sector and for a review of security at building sites after another stolen digger was used to rip a cash machine out of a building. There has also been a call for police to up patrols in a bid to catch those responsible and prevent further thefts. Glyn Roberts head of Retail NI which represents independent shop owners described the latest incident in Fermanagh as "disgusting". A digger was stolen and used to rip a machine from the wall at a petrol station in Irvinestown in the early hours of Sunday morning. The building was extensively damaged, as too was the digger used. It comes just two days after a theft at a Newtownabbey bank and what's thought was the remains of a cash machine found in a field in a burnt out van. There have been a spate of incidents over recent weeks leading police to establish a special taskforce to probe the thefts. Officers are working to see if there is a link. Retailers are concerned banks may opt to remove their machines potentially cutting off rural areas from access to cash in their communities. Glyn Roberts said the growing number of incidents was now a "major concern, given that these criminal gangs are able to hit retailers and bank branches in every part of Northern Ireland”. "I will be seeking urgent clarification from the PSNI on the status of their investigation," he said. "Retail NI will also organise an urgent meeting of representatives from banks, the construction sector and the PSNI to discuss this crisis. The security at building sites needs to be urgently reviewed, given the apparent ease that these gangs can steal diggers and use them in these attacks. DUP leader Arlene Foster said the shop would have to rebuild and she would be speaking with police about catching those responsible. UUP MLA Rosemary Barton said the ATM was "crucial" to the local community. She also called for a review at building sites and for owners of diggers. "It seems that ATMs are removed without any fear of culpability, which is not acceptable," she said. "These despicable actions have become all to prevalent over the past few months across Fermanagh and South Tyrone, it must be made a priority now for the PSNI to put more resources into trying to prevent such deeds," she said. "Patrols must be increased during the hours of darkness and a greater effort made to apprehend and bring to account those responsible." 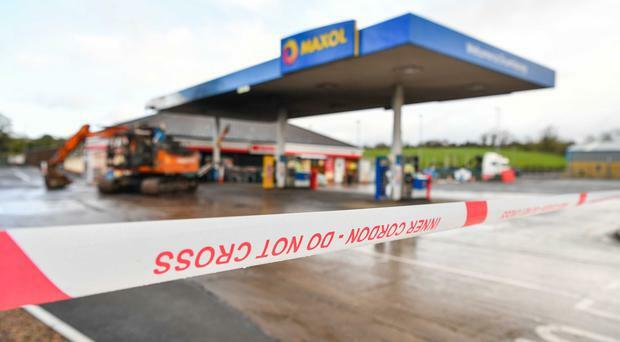 In the latest incident at the petrol station on the Dromore Road in Irvinestown, Co Fermanagh police said they believed the machine was taken from the scene on the back of a trailer and the digger set alight. Detective Sergeant Brian Reid said: “Thieves used a digger to remove the ‘built in’ cash machine from a filling station on the Dromore Road at around 4.05am causing extensive damage to the building. We believe the culprits used a trailer to remove the ATM from the scene. "Were you in the Dromore Road, Irvinestown area between 3.30am and 4.10am? Did you see what happened? Did you notice any vehicles being driven in a suspicious manner in the Irvinestown? "If you have information which you think could help our investigation, please pick up the phone and call detectives in Omagh CID on 101, quoting reference 306 of 24/03/19.